The students were recognized on Thursday, March 15, during a celebratory reception in the school’s library. 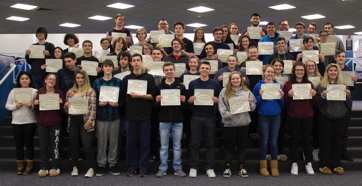 To be eligible, students in the Class of 2018 had to achieve an Advanced score on one of the three high school state assessment tests in ELA, Mathematics or STE, and score at the Proficient level or higher on the two remaining tests. Their combined scores must also place them among the top 25-percent of students in the graduating class within their district.